Charm, elegance and grace are three words which describe the timeless Whitney arrangement. 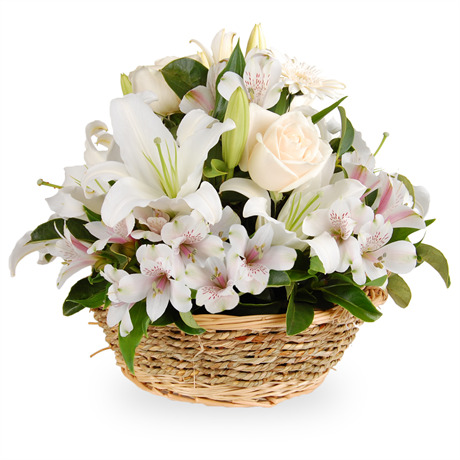 This keepsake wicker basket flourishes with the minimalistic hues of ivory white and lush green and makes a refined gift no matter what occasion it is used for. Soft mini gerberas, alabaster Oriental lilies, ivory roses and gentle alstromeria are beautifully blended among subtle green foliage. Appropriate as a bereavement gift, a birthday gesture or even as a table centrepiece, this gift is always well received and showcases your generosity and care.